Although summer is just around the corner Spring is still very much in swing. The sun has been shining and we have been blessed with some beautiful days. For me Spring and Summer is all about flowers I have seen so many beautiful bluebells, daisies and you will have seen them on Instagram. When JD Williams got in contact and asked me to put together a Summer outfit I wanted a floral boho vibe and there was plenty to choose from. 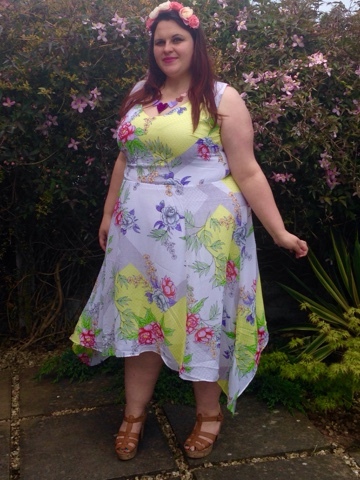 I picked out this lovely summer dress from JD williams. 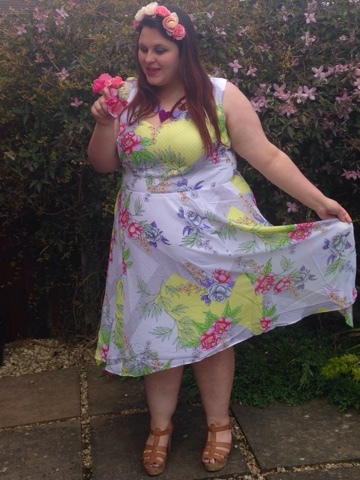 In this outfit I am breaking all the rules put upon plus size ladies I have my legs out,my arms free and I am wearing the hanky hem shunned by so many. You know what? It works and I felt so pretty. Do not be afraid to bare skin this summer get a tan, don't hide away! 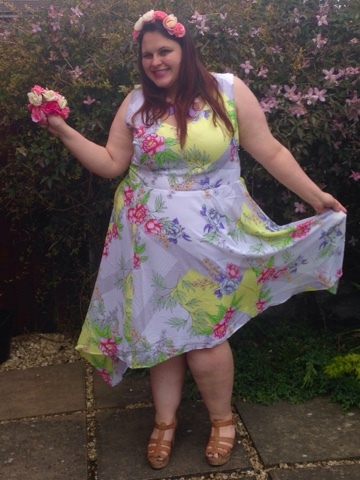 This is a floral dress with a difference, I loved the splashes of colour with the yellow reminding me of sunshine days complimented by the pinks and blue/lilac flowers sprinkled around the dress. I have never been much of a fan of wearing white but the colours make the dress more wearable and interesting. Fully lined the dress is of beautiful quality but still feels really light and airy. It would be perfect to wear to a Spring/summer wedding or even for a stroll along a hot beach on holidays. The underskirt means you can feel secure when the breeze floats the light fabric of the longer hem and gives you a very feminine appeal. I opted for a 22 and it was very true to size. The subtle v neck isn't too low like some dresses can be. I think this is an ageless picot suitable for young and more mature ladies looking for some floral sunshine in their wardrobe. A lot of people shy away from the hanky hem thinking it has been over used and enforced on the plus size community. I personally think it works on this dress with a dipped hanky ham on the sides it really gives the dress a more boho free spirited appeal. Even those who shy away from getting their glorious beautiful legs out can feel comfortable as you feel like you're not totally on display. No summer outfit is complete without shoes and Jd Williams has a wide range of sandals. I teamed this outfit with some chunky tan sandals from Sole Diva. They are a wider fit so extra comfortable and the chunkier heel makes them easier to walk in. I really like the cork style effect on the platform and heel of the shoe and think they are really versatile for a Spring and summer wardrobe. As I said I wanted a boho feel and accessories really bring that looks together summer is a great time to rock flower crowns and fun jewellery. What will you be rocking this summer? I love the print on that dress. I really want to wear more yellow this summer. that dress is absolutely lush on you! I have to admit, I love a hanky hem. I know, no one does, but I love them! Dress is gorgeous on you and the sandals are gorgeous - I really like them. It's definitely a dress that would suit women of all ages. You look beautiful! Absolutely love the dress! I can't wait for the sun to come back so I too can get my floral dresses out the closet! This dress is fab! Perfect for summer and festivals! You pull that dress off perfectly! Definitely suits you, don't know if I could pull it off quite as well though! Your dress looks lovely. The cut really suits you and it looks very flattering. There are no rules haha, just do what you want! The dress is lovely on you. It's a beautiful dress for the summer, love the shoes too. This is a really cute dress. I think this is an awesome fun, energetic look for the spring and summer. I love shoes like this with a chunky heel! Perfect for a summer BBQ or an outdoor party so you don't sink into the grass! I love the print of the dress, perfect for Summer! 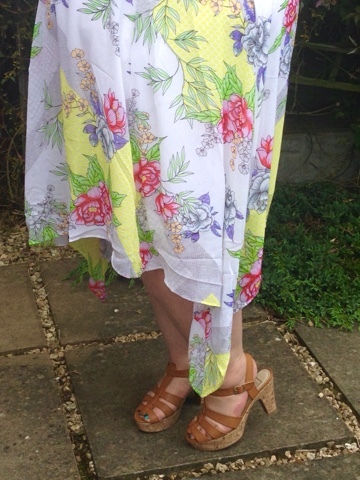 such a pretty dress - perfect for the summer, lovely and cheery! This summer dress looks great! Can I make a side note about your flower crown? Love it! That's such a gorgeous dress, the colours are so pretty and you look lovely in it! Lovely dress. I like the summer print. It's nice to have a flow with a dress for those hot days. I love spring and summer style. I don't specifically wear florals, although I love them too. I do war a lot more color during these seasons. That dress really suits you and those shoes are gorgeous! That summer dress is so pretty. I love the design. Love the dress and you look gorgeous hun! beautiful summer look! i love the floral theme especially the floral headband! Yay for breaking the rules, you look AMAZING! I really adore the colours in the dress, so pretty!